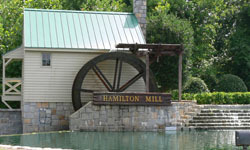 Hamilton Mill, located in the City of Dacula in Gwinnett County, has approximately 4,000 luxury and single family homes. Residents in this community enjoy a swimming pool, tennis courts, golf course and clubhouse with a fitness center. Located just of I-85, Hamilton Mill is close to the Mall of Georgia and a new Wal-Mart. Students attend Gwinnett County Public Schools. New and resale homes range in price from $200K to $1 million.